This intriguing family story describes a woman’s search for her true mother. two young people whose love is threatened by lies and hypocrisy. Years later, living in New Zealand, Heather finally received a letter confirming the identity of her birth mother. As the story opens in 1975 she is battling immigration officials for special permission to travel to England to prove her identity. Without a birth certificate this is no easy task. Heather Tovey was born in London in 1911 and raised by a governess. At 18 she secretly married artist Gordon Tovey, who went on to revolutionise art teaching in New Zealand schools. In her 60s Heather finally learned the identity of her mother, and in 1975 travelled to England to pursue her quest to find her family. The truth behind all the secrecy is the subject of Searching for Grace. Heather died in 2004, aged 93. Carol Henderson, Heather and Gordon’s daughter, worked as an art specialist and primary teacher. In 1998, having retired to follow creative ventures, she published A Blaze of Colour, a biography of her father, and began to help Heather record her early memories. 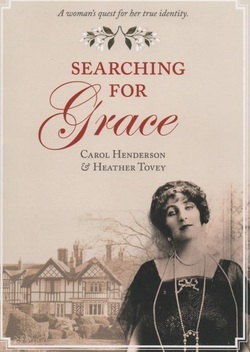 In 1980, with husband Neil, Carol had travelled to England on the first of several trips to meet with Heather’s newly discovered relations and seek further answers.